The 2797 has worked great for me for 70,000 miles in all types of riding and weather. It was great to find a way to access the audio and microphone so that I could input the audio into my audio system and do voice commands and not have to touch the GPS to look up things or start or stop a route. the Bluetooth with the phone was also great. The 2797 has a much better interface than the Zumo 550, 660 & 665. I think the new Zumo 590 has some of the new interface. 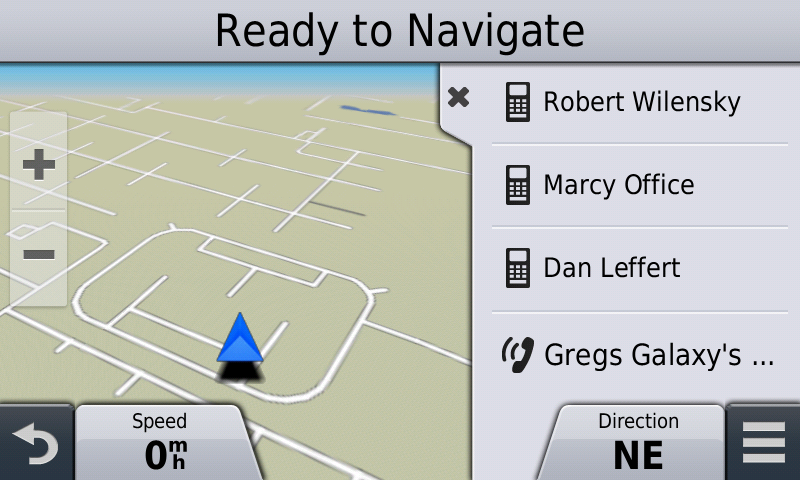 All that being said I must tell you that Garmin recently came out with a new truck GPS ( Dezl 770LMTHD ) that one upped the 2797 by adding the ability to connect to a Bluetooth headset like the Zumo models do and a cell phone at the same time. I waited for refurbished models to show up on the market and I bought one to test. 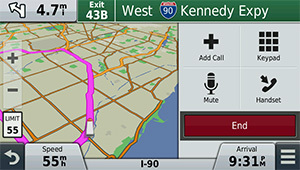 With the ability to connect to a Bluetooth headset and a cell phone it would mean I would not have to open up the GPS to tap into the audio and microphone. Of course this meant I needed to move to a Bluetooth headset to be able to connect to the Dezl 770. So a week ago I decided to buy a refurbished Dezl 770 ( $289 ) and a new Sena 20s headset to test everything out. I bought it all on Amazon so if it did not work I could easily return everything. Well, it all worked great. I was very resistant to moving to a Bluetooth headset as I did not want to have to carry extra batteries and earlier Bluetooth headsets could not be charged while you were using them. With the Sena 20s you can charge the headset while using it. So I have been testing the setup and so far it is working great. To get all of the audio from the Gold Wing ( laser jammer, radar detector, XM radio, MP3, navigation commands and CB ) I bought a Sena SMH10 and the Sena custom cable for the Gold Wing. The Sena SMH10 then connects to the Sena 20s by Bluetooth and I can hear all of the audio for the Gold Wings audio system. It is all very clear and seems to work great. My reason for doing this is the cost of the Zumo models, the 590 is around $899, I bought 2797's for $175 and the refurbished Dezl 770 I bought for $289 on Amazon. I am still trying to find the best way to mount the Dezl 770. Ram Mount made a great mount for the 2797 but does not yet make a mount for the Dezl 770. The Dezl 770 is about 1/2 inch wider than the 2797 so the current Ram Mount will not work. I bought a medium size xgrip Ram Mount and it works out but I am not happy with it. I am working on a aluminum case. I wanted to be sure I informed everyone of this in case you are thinking of buying a 2797 soon. I am going to put together a webpage once I finish my testing. I have been using the Garmin Dezl 770 for 55,000+ miles on two different motorcycles ( Gold Wing & BMW RT ) now and there have been no issues. I have ridden in rain, snow and sand storms and the Dezl 770 has had no issues. The Dezl 770 is a more sturdy GPS than the 2797 and has worked flawlessly. The Bluetooth connection to my cell phone ( now Samsung S8 ) and my Sena 20s headset has worked flawlessly for all 55,000+ miles. I bought a 2016 BMW RT and moved the Dezl to it and it is a nice fit on the RT. I was able to mount the Dezl 770 on the left handle bar and power it from a FuzeBlock. The routing and map drawing is faster than the Zumo's and the 2797. 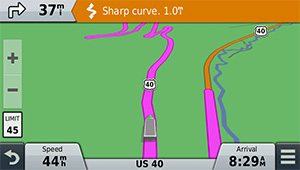 The extra features like uphead ( 3 POI types you can pick to show up on the right side of the map with the distance to the type of POI ), the highway mile marker number when on Interstate Highways and how the weather and traffic display on the right side of the map so you can still see the route map really are nice and make the Dezl 770 a good GPS for a motorcycle that has Bluetooth. The Dezl 770 has many of the same features of the 2797 but adds a few more along with the ability to connect to a Bluetooth headset like the Sena 20S. Ram Mount makes a nice locking mount for the Dezl 770 that helps make the Dezl waterproof and it has a built in sun visor. I have been wanting a GPS with voice command navigation capabilities to mount on my Gold Wing for many years. My car has had it for over 5 years and I could not understand why Honda had not added that functionality. Of course Garmin has had voice command GPS's for many years just not a waterproof version that could withstand the outdoor elements. Harley Davidson beat Honda to the punch by offering a voice command entertainment system that included navigation and phone functionality in the 2014 line of motorcycles. I was waiting on the 2014 Gold Wing announcement hoping that Honda was not far behind. About a month later Honda announced the 2014 Gold Wing with no new options so I got little pissed and decided to take matters into my own hands and see if I could integrate a Garmin voice command GPS into the Gold Wing's audio system. I did some searching for what I thought would be the best Garmin GPS to use on a motorcycle and I decided on the Nuvi 2797. It has a large 7 inch screen that was similar in size to the built in Honda GPS and with lots of new features that would be nice to have along with the voice command functionality. Another reason I chose the Nuvi 2797 was that Ram Mount was coming out with a new lockable mount for it and it also included a built in sunshade. From the photos I saw of this new mount I knew it was also going to help make it water resistant which is very important if I plan to use this GPS in rally's and LD rides. I also was tired of spending $800+ to get a waterproof GPS that was not as good as many of the $200 GPS's. 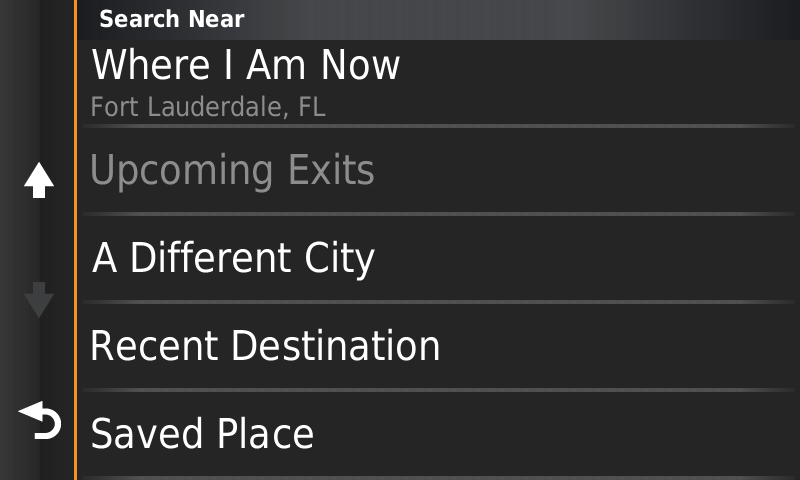 I was not sure how I was going to make this happen so to be sure I did not waste to much money I searched for a refurbished Nuvi 2797 in case I destroyed the GPS. I found one for less than $200 and ordered it. While I waited for the GPS to show up I did a lot of internet searching to see if anyone else had tried what I was thinking or if I could find some photos of the inside of the Nuvi 2797. I had no luck as I guess it was just still to new for someone to have opened one up to see what was inside. The GPS showed up at my door a week later and I could not wait to bust it open and see if it was going to be possible to tap into the speaker and microphone circuits. I don't think I turned the GPS on more than once before I decided to open it up. I needed to find a special star shaped screw driver to fit the small screws on the back of the GPS case. 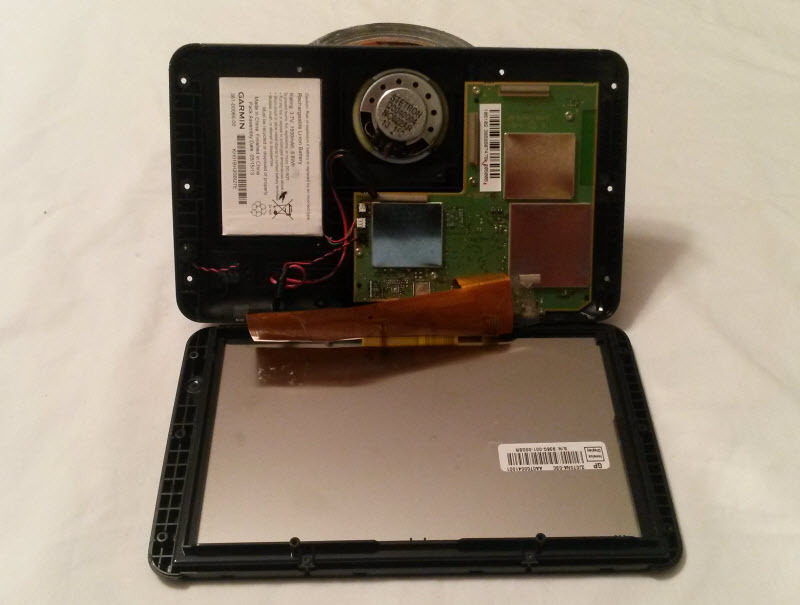 Once I found it I unscrewed the 10 screws and removed the back of the case. 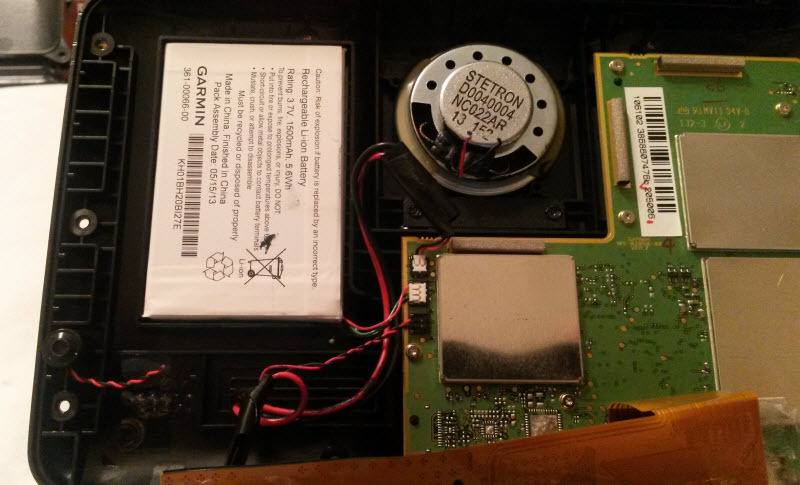 I quickly found what I was hoping for, wires running from the motherboard to the speaker and internal microphone. 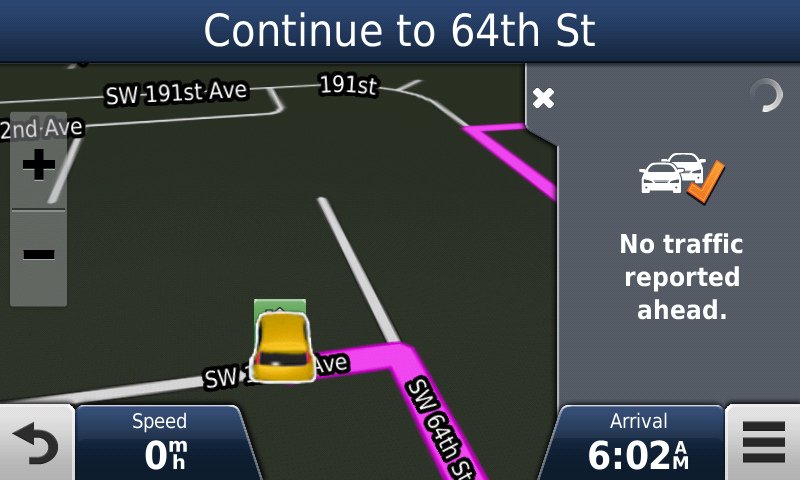 Bingo, now I knew I could integrate the GPS into the Gold Wing's audio system. All I would need to do is tap into the speaker and microphone wires, drill a small hole in the back of the GPS case and route the wires through the hole. Then I needed to add some plugs to the ends of the wires so I could easily unplug the GPS when I needed to remove the GPS from the motorcycle. The next step was to route the speaker wire from the GPS to the AUX input on the Gold Wing's audio system and then use a Kennedy Cellset Zumo microphone integration kit to tape into the Gold Wings headset cord for the microphone. This allows me to use the headset I have in my helmet to speak voice commands to the GPS. It was a lot easier than I thought it would be to make this happen. I wish I had done it sooner. I needed to test the setup so I rode to Charlotte, NC for work one week instead of flying. This was a 1500+ mile round trip and I was very surprised at how well everything worked. 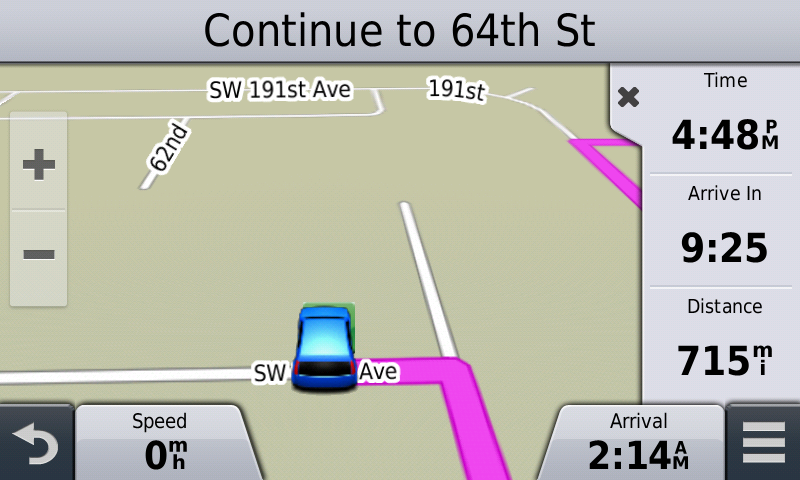 The Nuvi 2797 is a much better GPS for navigation than any of the Zumo's. The map drawing is very fast, the route calculation is 5 times faster than the Zumo 665. The screen is much easier to read ( I added a non-glare, anti-fingerprint screen protector ) than the Zumo and is much larger. The screen buttons are bigger than a Zumo's so it is easier to use with gloves. 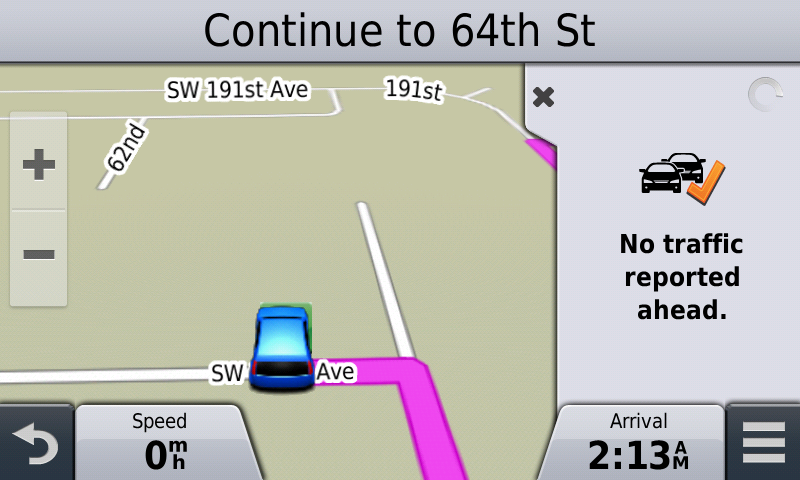 A couple other features on the Nuvi 2797 are Garmin Real Directions and Garmin Real Voice which provides better route guidance directions like turn left at the next traffic light. I have ridden over 2800 miles with the Garmin Nuvi 2797LMT mounted on the wing and ridden in the rain over 500 miles and so far everything works great and I have not had a problem with the GPS getting wet. I have added the Ram Mount case and some gorilla tape in place that rain could possibly get in. I also will be carrying a extra large baggie for those times when I think I may need it. 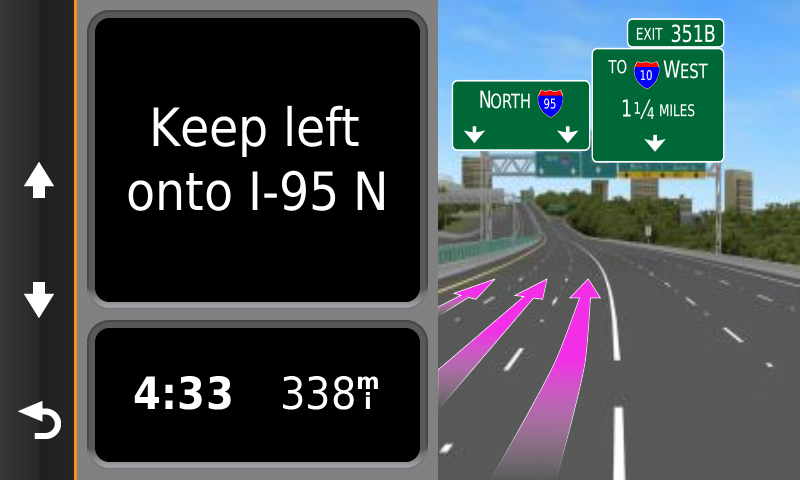 The Nuvi 2797 also has Garmin's Smartphone Link app which provides weather, traffic and other information by way of an app on your phone and a Bluetooth connection between your phone and the GPS. The weather is much better than what is on the Zumo but it is limited to cell phone coverage. 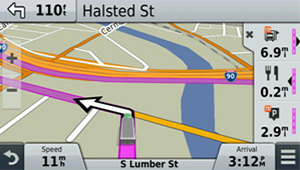 It also includes the ability to view traffic cameras from anywhere in the US on the GPS screen. This will come in handy when you get traffic alerts and not sure if they are real or not. You will just pull up one of the available traffic cameras and see if the traffic is really backed up. I can now use the voice command capabilities of the Garmin Nuvi 2797 with the headset installed in my helmet. It works pretty good and allows me to control the GPS without taking my hands of the handle bars. I can find a location, start a route, add to a route, stop a route and search for pretty much anything. I can also make phone calls by voice command. Many have asked why I just did not pair a Bluetooth headset with the 2797 and the reason is that most of the automobile line of GPS's from Garmin do not pair to a Bluetooth headset, only a Bluetooth cell phone. 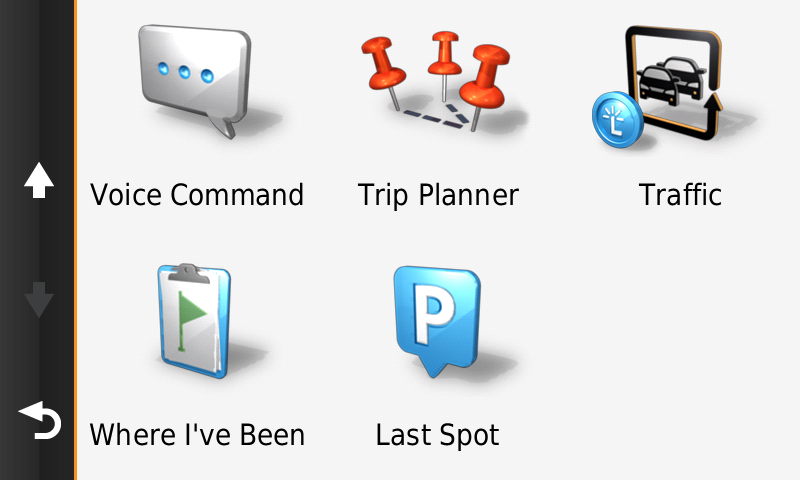 Here is a list of Garmin GPS's that will pair to a Bluetooth headset ( I got the list directly from Garmin ). 1 The Zumo 220 and Zumo 350 do not have the ability to pair to a Bluetooth-enabled phone and will only pair to a Bluetooth headset or helmet. 2 The Zumo 390 must be paired with a headset or helmet and a phone. I have been using my Garmin 2797 mounted on my Honda Gold Wing now for over 30,000 miles with no issues. I now have the Garmin 2797 mounted on the left handlebar to make it easier to reach. I also now use the Garmin 2797 for my cell phone Bluetooth connection since I moved the 2797 to the left handlebar. I have ridden in heavy rain for many hours and have had no issue with water entering the GPS. I was concerned about vibration on the motorcycle as it is much more than in a car ( yes even though I ride a Gold Wing ) and so far there has been no issues. I have ridden 6 BBG's ( 1500+ miles in 24 hours ) with 4 of them being back to back to back to back, a endurance rally in Nevada and many hard miles with many deep pot holes during the 30,000+ miles with the Garmin 2797. 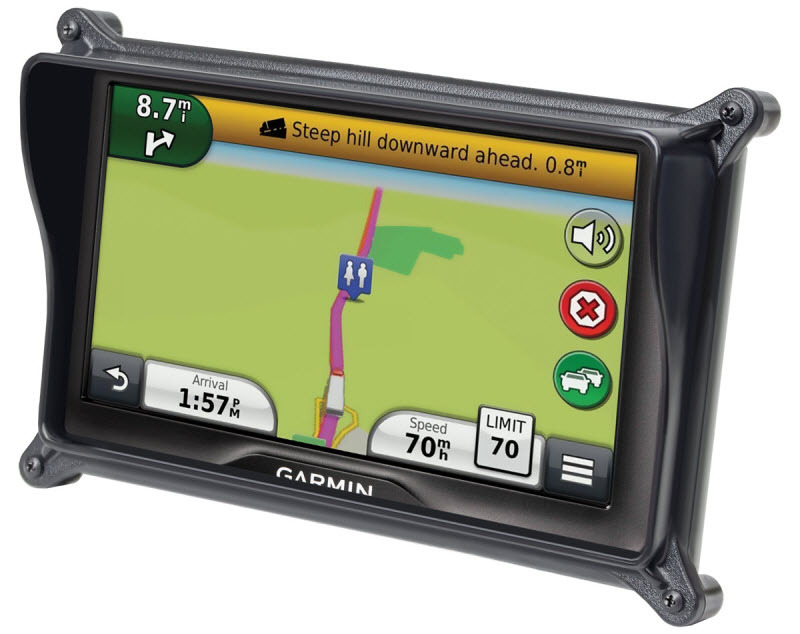 The 2797 is a much better routing GPS than the Garmin Zumo's and the built in GPS navigation of the Gold Wing. 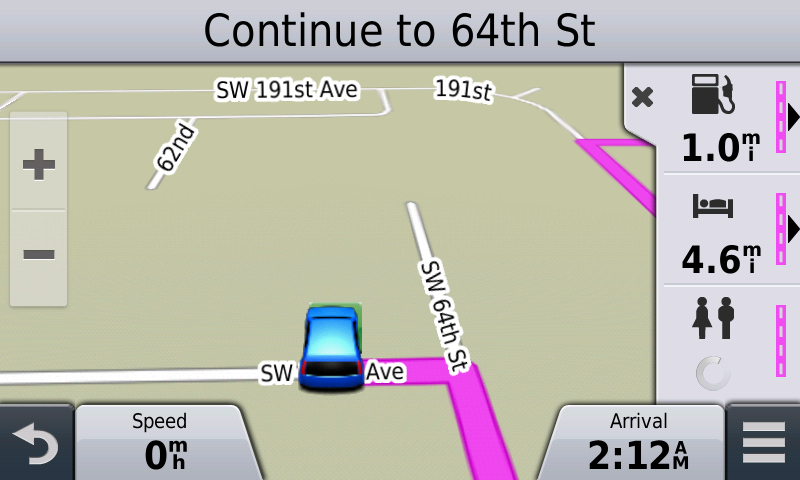 It routes about 3 times faster, draws the map screen much faster and is easier to read. 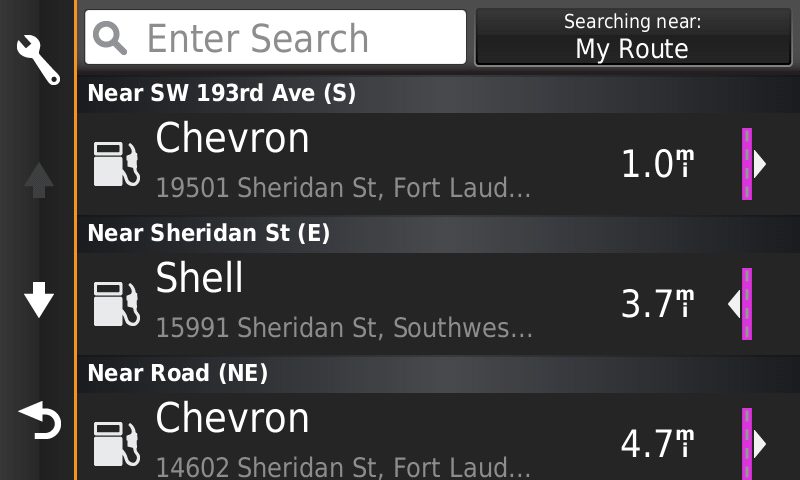 I found the up ahead feature to be really nice and makes it very easy to find services along your route. I have been using the voice commands of the 2797 since I integrated it into the Gold Wings audio system and found it to work very well even at high way speeds. There are some voice commands that do not seem to work very well but it just may be my voice. 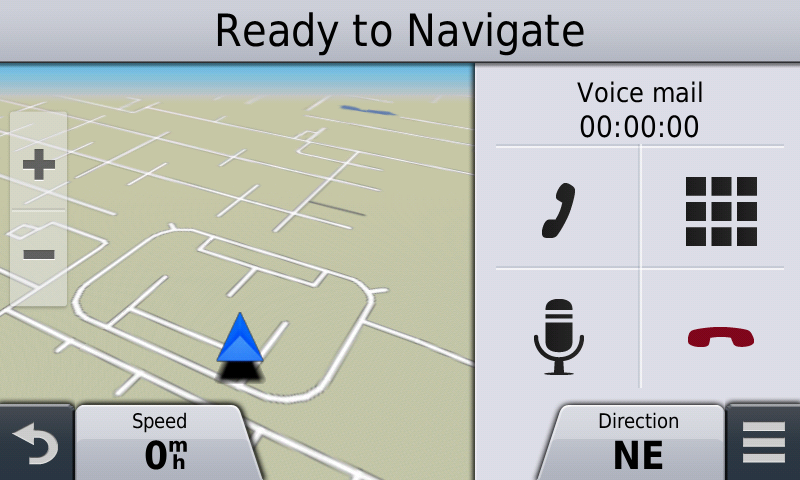 I can search for POI's, saved favorites, saved routes, stop and start routes with voice command. I have added some more screen shots of the 2797 below. I wanted to describe how I get the audio from the 2797 into the Gold Wing as the 2797 is not stereo and the Gold Wing has multichannel audio. I bought a 3.5mm stereo cable from Radio Shack and cut off a about 6 inches of the cable with the female plug. I then took the black wire from the Garmin 2797 speaker ( see photos below ) and connected it to the braided wire from the cable from Radio Shack. Then I took the red wire from the Garmin 2797 speaker and connected it to the two other wires in the cable from radio shack so that the audio from the Garmin 2797 would be in both stereo channels on the Gold Wing. 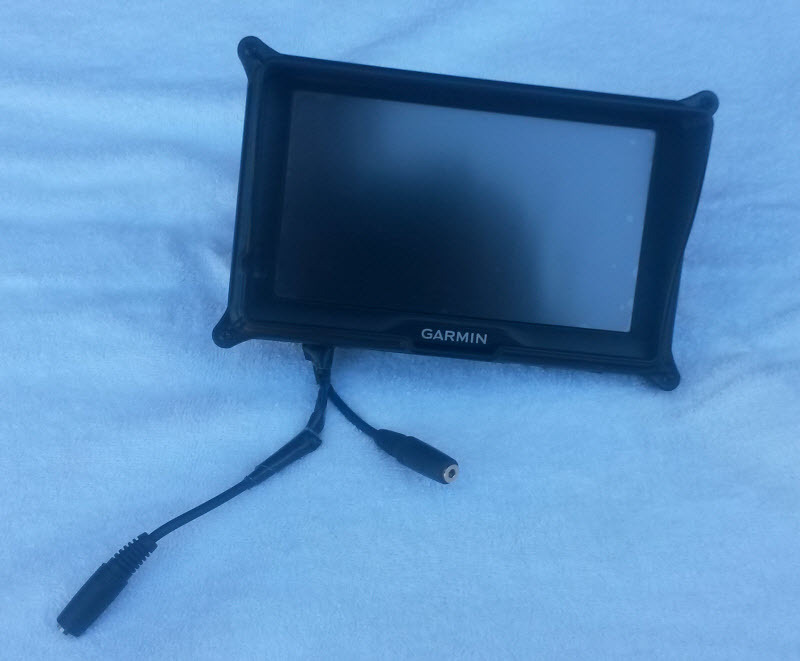 I recently modified another Garmin 2797 for a friend and did a little better job with routing the wires out of the GPS case. Here is a photo of the Nuvi 2797 with the Ram Mount and the plugs I added for speaker and microphone integration into the Honda Gold Wing. This is a photo of the back of the setup. 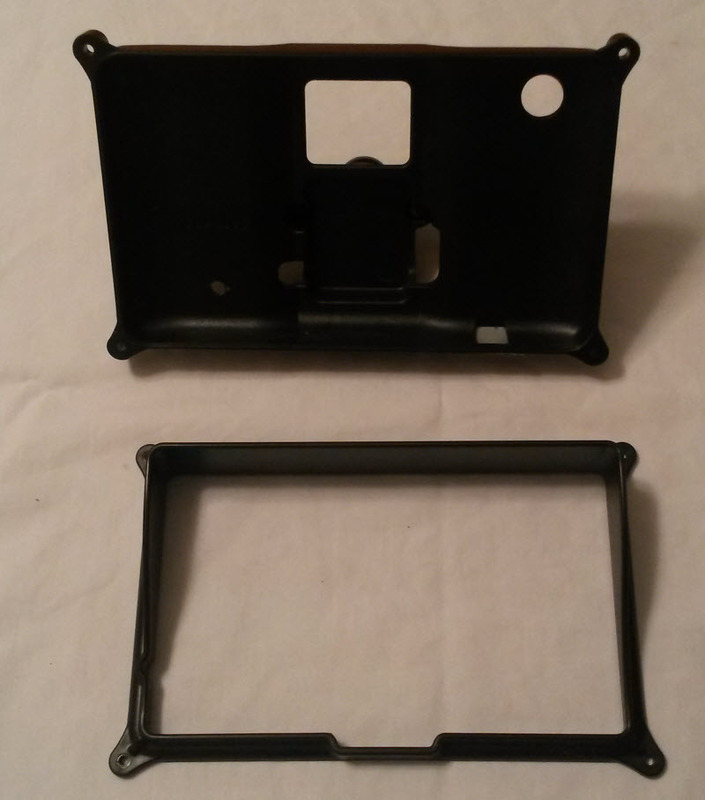 I had to drill a small hole in the Ram Mount to match the small hole I had drilled in the back of the Nuvi 2797 case. Right now I am using Gorilla tape to waterproof the holes I drilled. I plan on doing something different once I am sure everything is going to work. 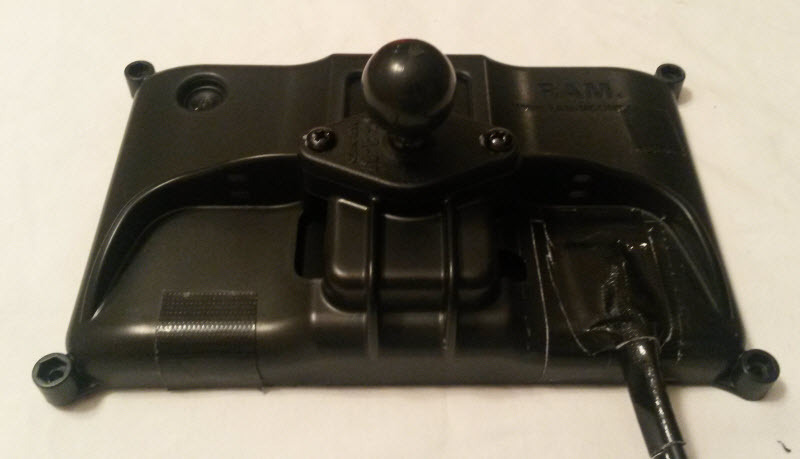 This is a photo of the Ram Mount. This is a photo of the back of the GPS with the Ram Mount and the hole I drilled to pass the wires from the inside of the GPS. This is a photo of the back of the micro SD card hole and the USB port to connect to the computer with out the Ram Mount case. 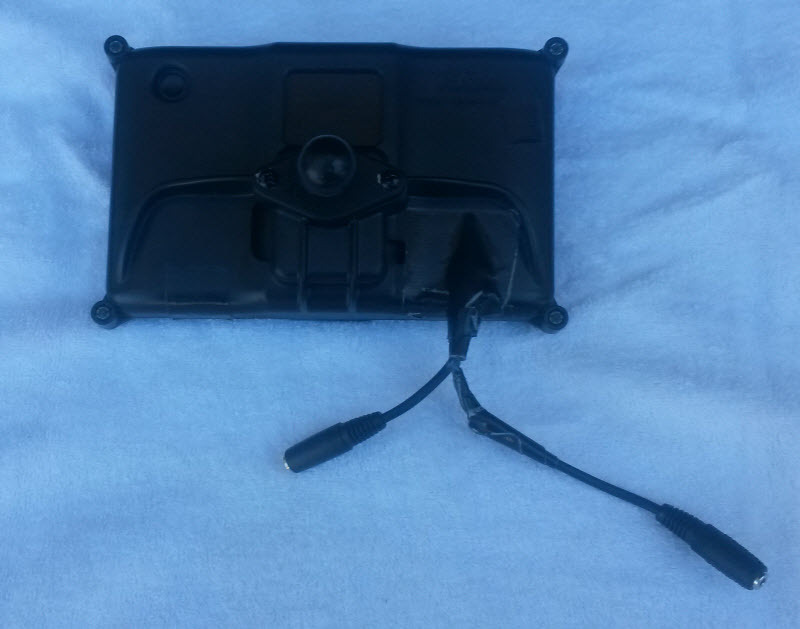 This is a photo of the back of the inside of the GPS where the speaker and microphone are located. This is a close up photo of the inside of the GPS to better see the speaker and microphone wires I cut and spliced in longer wires to pass through the hole I drilled in the GPS case. The microphone is in the bottom left side of the photo where the red and black wires go. This is a photo of everything back together. You can see the gorilla tape I used to cover the hole through the Ram Mount and the GPS case. 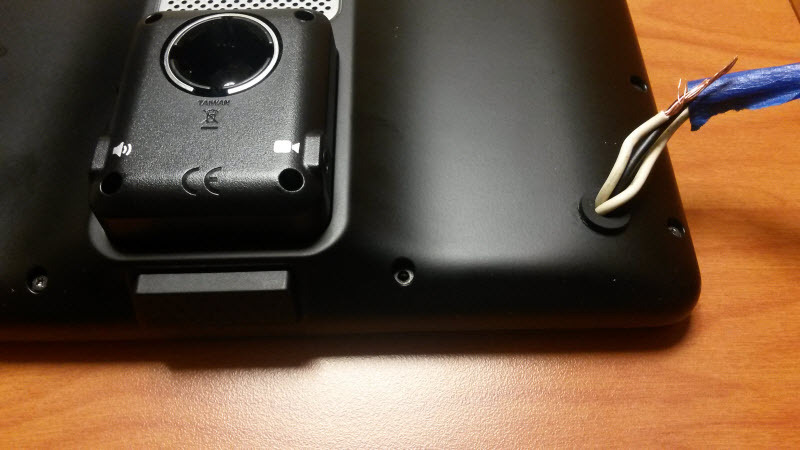 You can also see the gorilla tape covering the hole for the USB cable on the left. 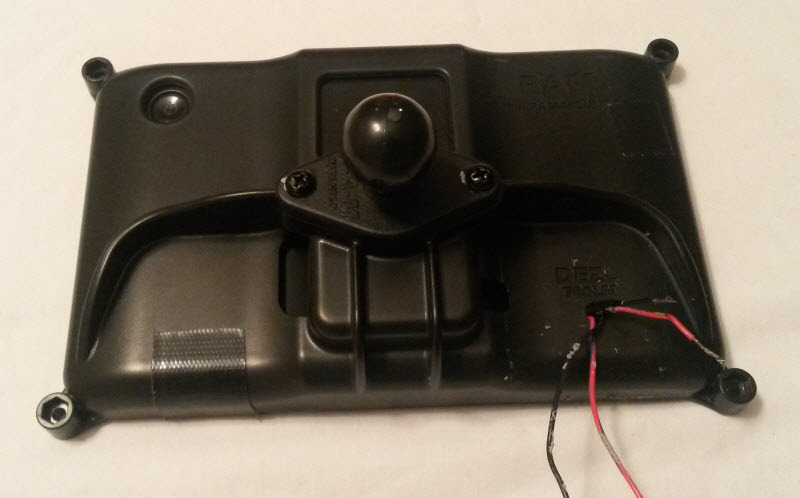 A photo of the Ram Mount for the Garmin Nuvi 2797 ( also fits the Dezl 760LMT and the RV 760LMT ). 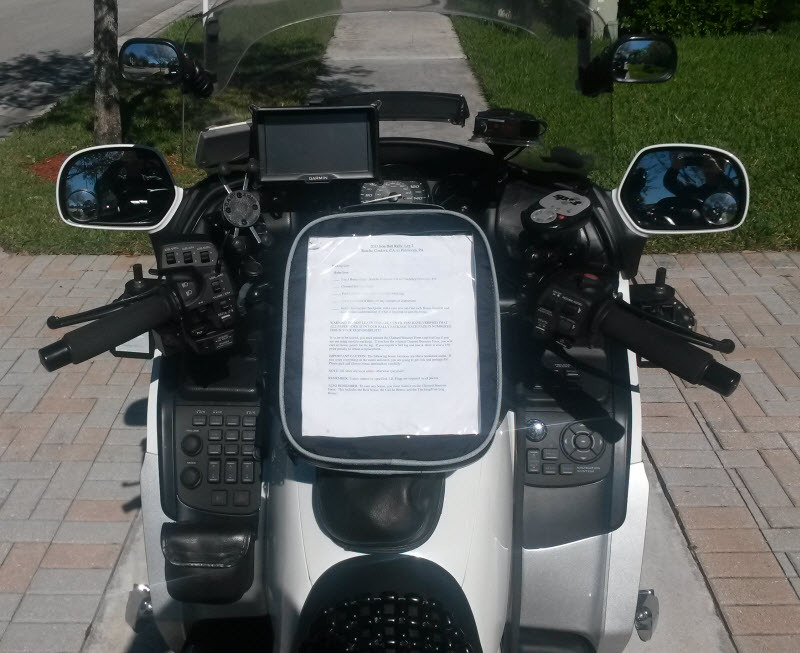 A photo of the Nuvi 2797 mounted on the Gold Wing. This is the navigation screen which is pretty glove friendly even with the antiglare / anti-fingerprint screen protector I installed. The screen buttons are bigger than what the Zumo has. 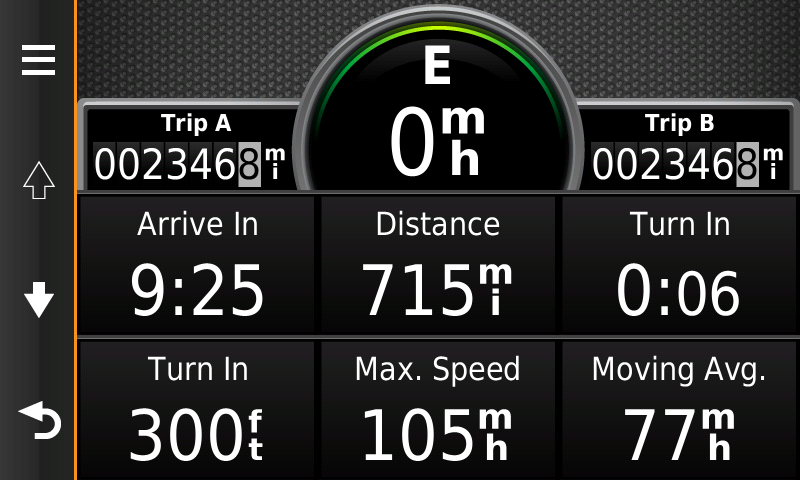 This is the trip data screen. More information on the trip data screen. This is the options you get by touching the button in the bottom right of the screen. 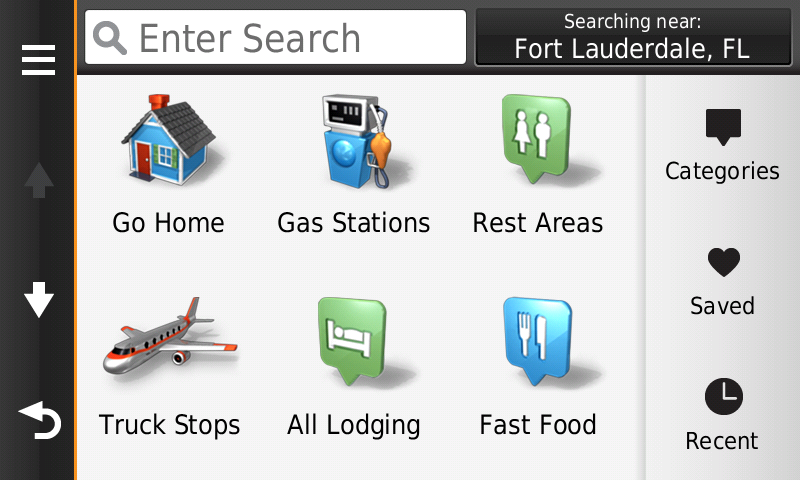 This are the different types of information you can display on the right side of the navigation screen. Below are some screen shots showing these. 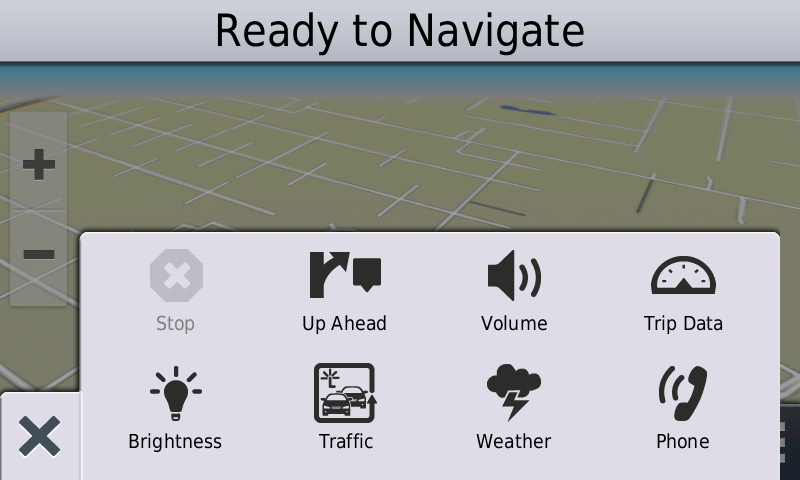 This is the Up Ahead option that is configurable of what type of information you want to see on the road ahead. I have gas station, hotels and rest areas. 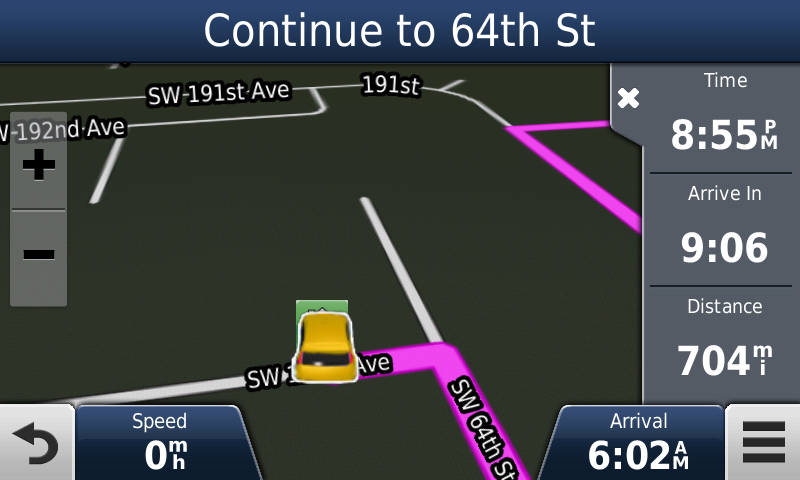 It also shows which side of the road the place is by the little arrow next to the pink road display. You can click on anyone of these and get a list of the information ahead. 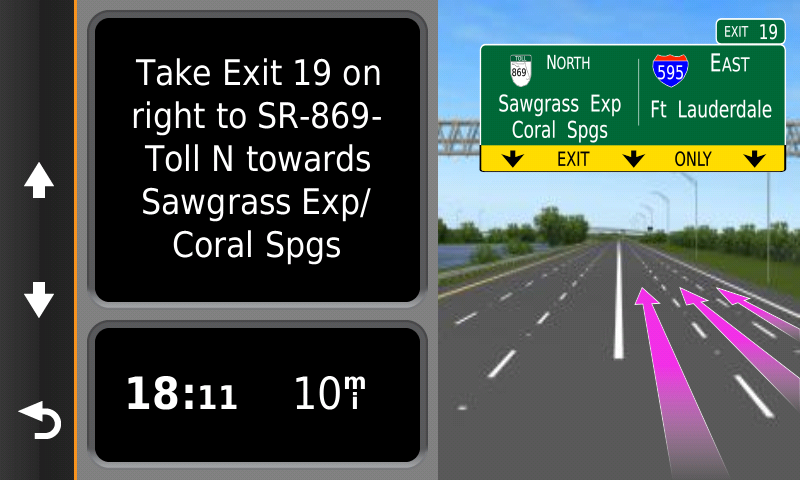 When riding on interstate highways it includes exit information. This information stays on the screen until you click the "X" to close it. I touched the gas station button above and got this list of gas stations near by. 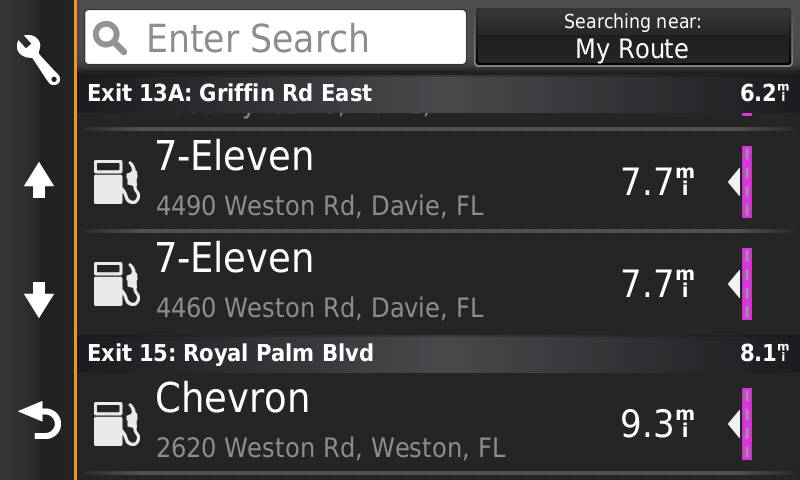 I touched the "Searching Near" button on the above screen shot and this is a list of how I want to search for the gas stations. 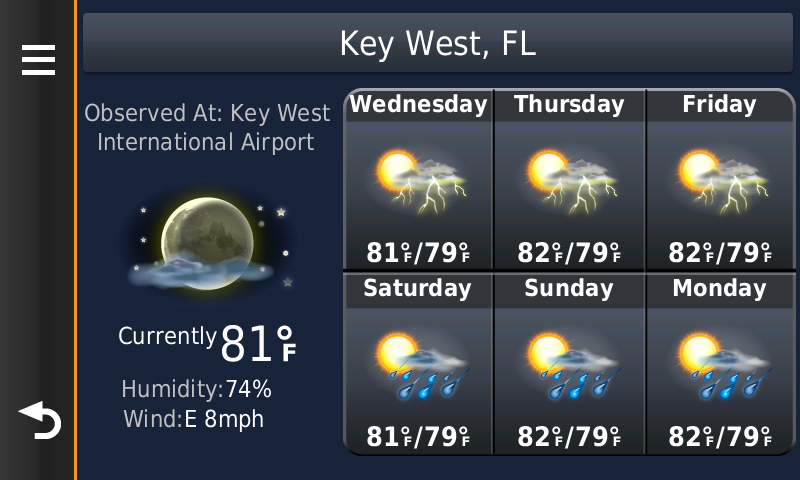 This is the weather data that you get from the Smartphone Link. You can touch this and get the below screens. 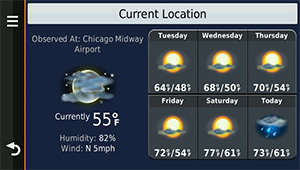 This is the weather from the closes location. By touching the button in the top left of the screen you get this menu for more weather information. This is the weather radar screen. There was no rain or snow near by so I panned the map and the next screen shot shows snow on the map. 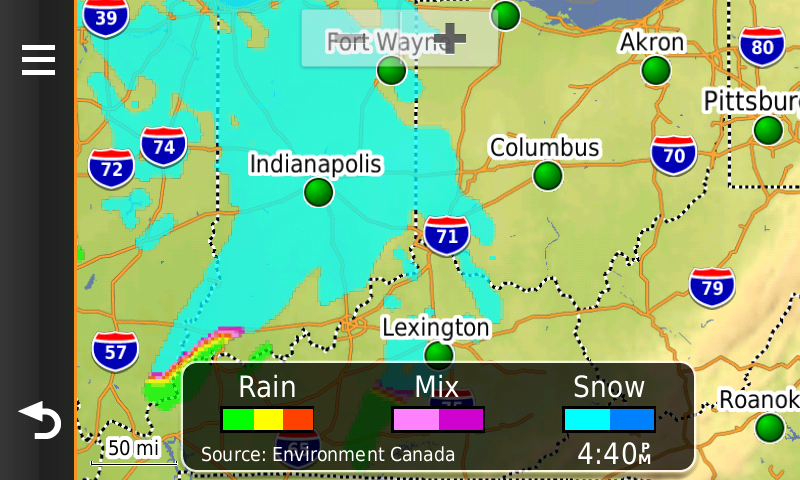 This is the weather radar screen with snow. 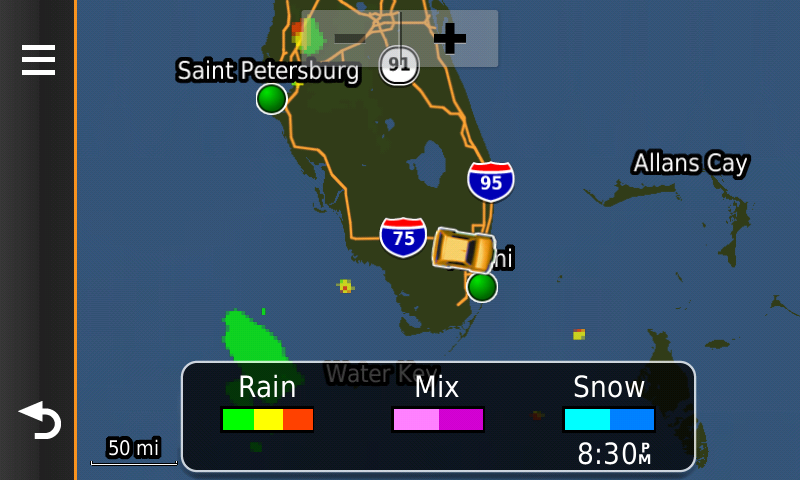 The weather radar can be animated and show the direction of movement of the rain or snow. This is the traffic information. If there was traffic it would show here and a possible detour around the traffic and how much time it would save it you took the detour. 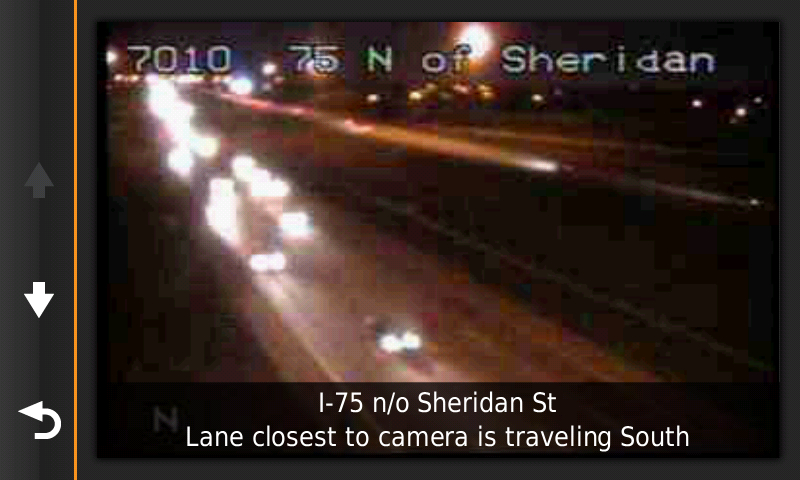 Here are some more traffic screen shots. This is the PhotoLive traffic information. 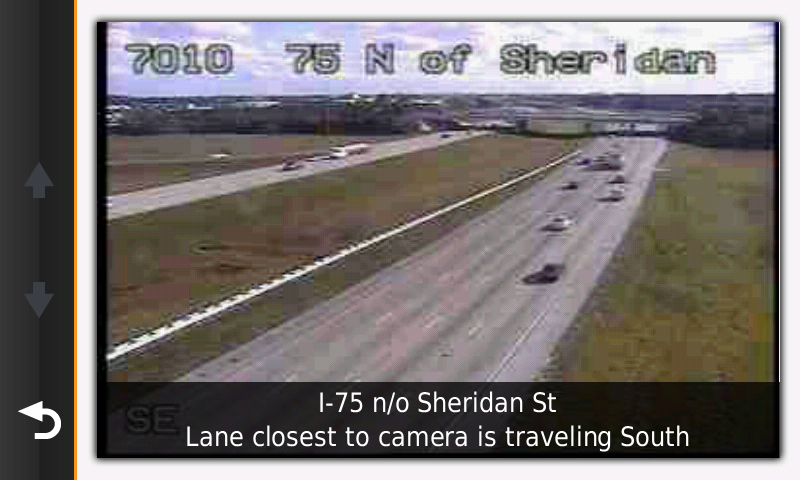 You can pick traffic cameras from anywhere in the country and have them displayed on the GPS. This is part of the Smartphone Link app. This is a screen shot of the traffic on a map. 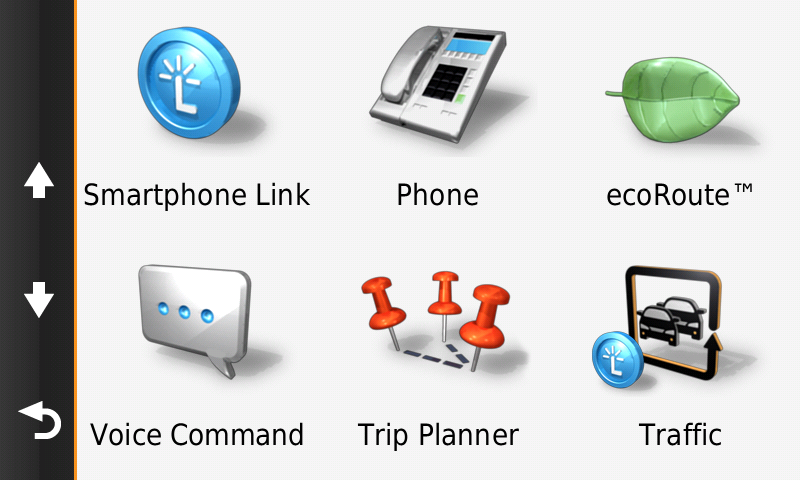 This is the trip information data that is also configurable as to what data is displayed. 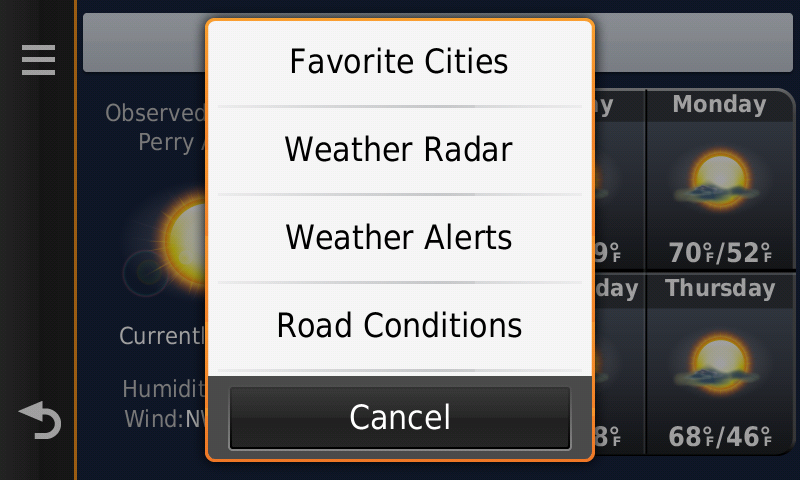 This is the screen you see when touching on the "Where To" button on the home screen. It is also configurable as to what buttons you see and the order of the buttons. This is the App screen you see when touching on the "Apps" button on the home screen. 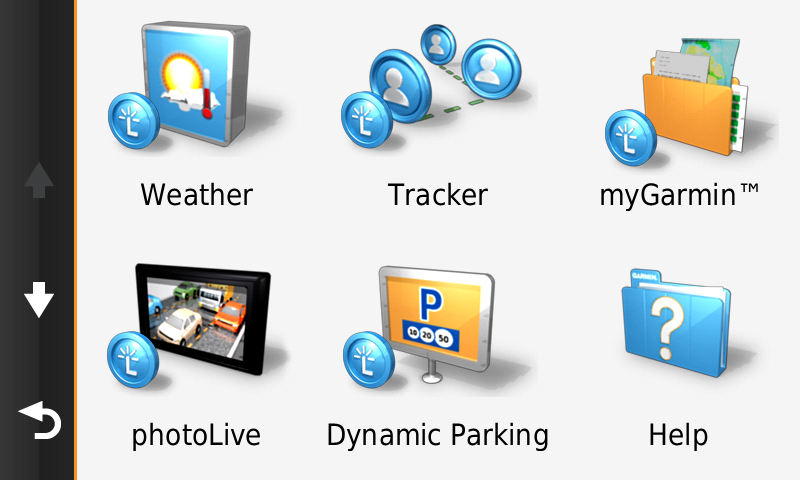 Some of these are apps that are getting data through your smartphone with the Garmin app called Smartphone Link. 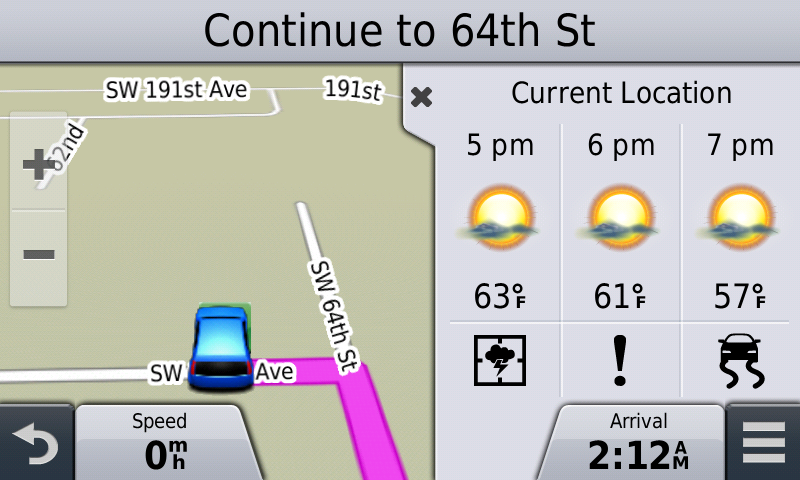 More apps on the GPS on the apps screen. 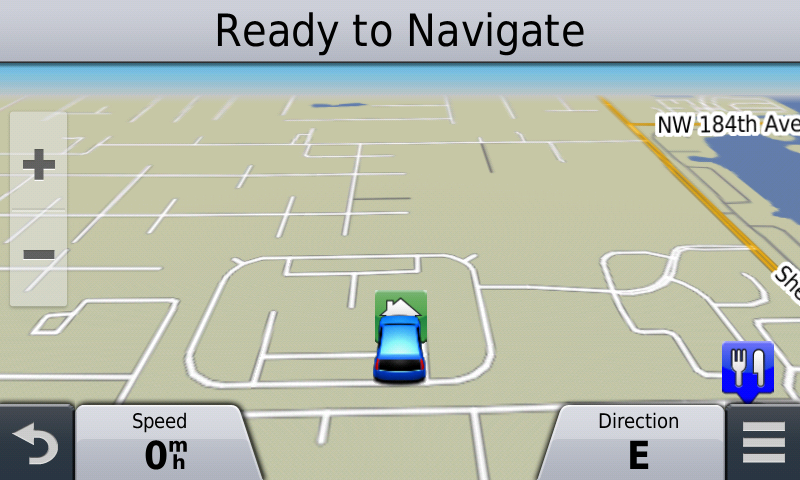 Even more apps on the GPS on the apps screen. 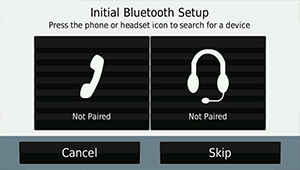 This is the phone options when connected by Bluetooth to your cell phone. You can see the last few calls you made easily by clicking on the phone button from the app tools ( the 8th screen from the top ). As you can see this new implementation of how Bluetooth is integrated into the GPS allows you to still see the route map while using the phone. No more missed turns because you was on the phone screen. This is the screen you see while you are on a call. Again, while on the call you can now still see the route map. Much nicer than before. 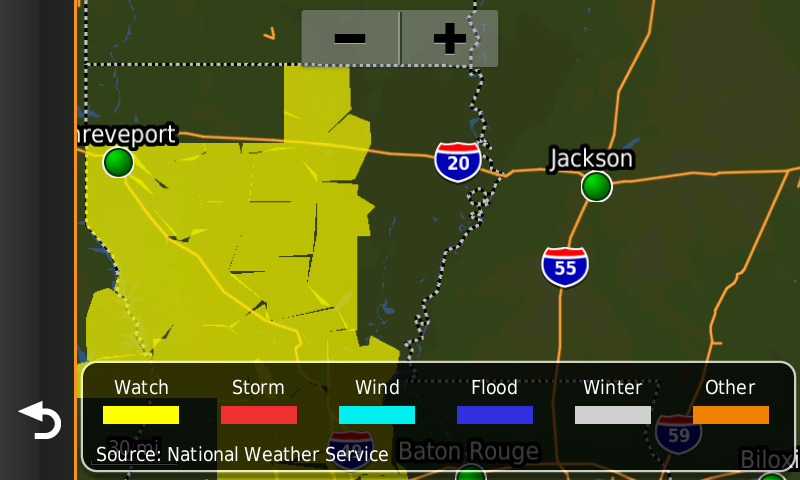 This is the current weather screen for your current location from Garmin Smartphone Link app. This is the weather radar screen. 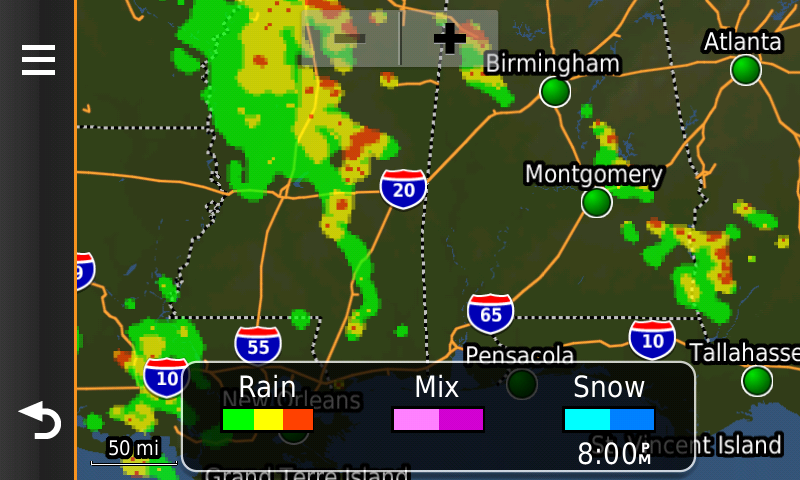 Another weather radar screen from Garmin Smartphone Link app. This is the weather warning screen from Garmin Smartphone Link app. 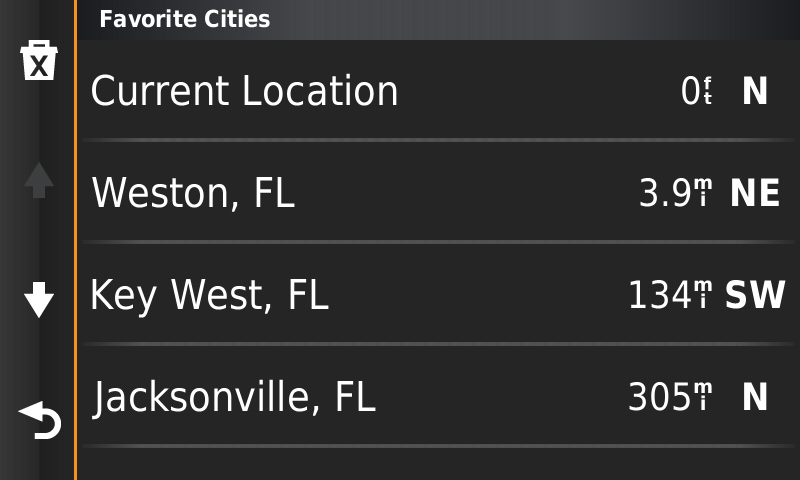 You can save favorite cities to quickly pull up the weather for that city. 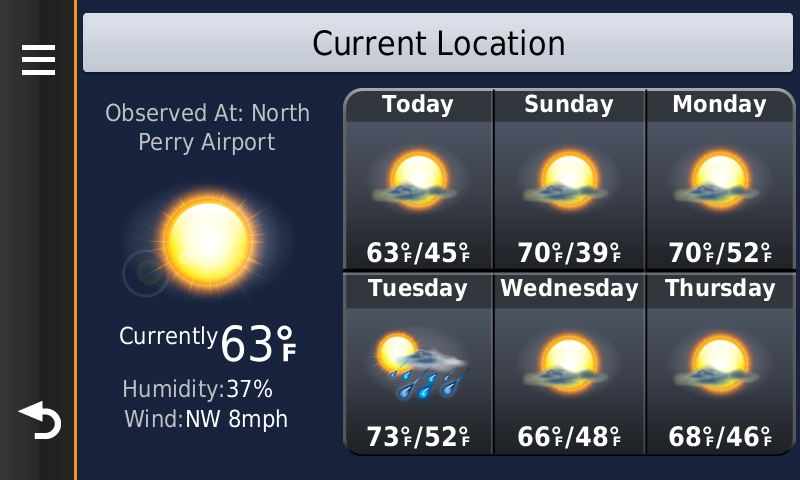 I picked a favorite city above for the weather there. This is the traffic camera screen you can see on the GPS. 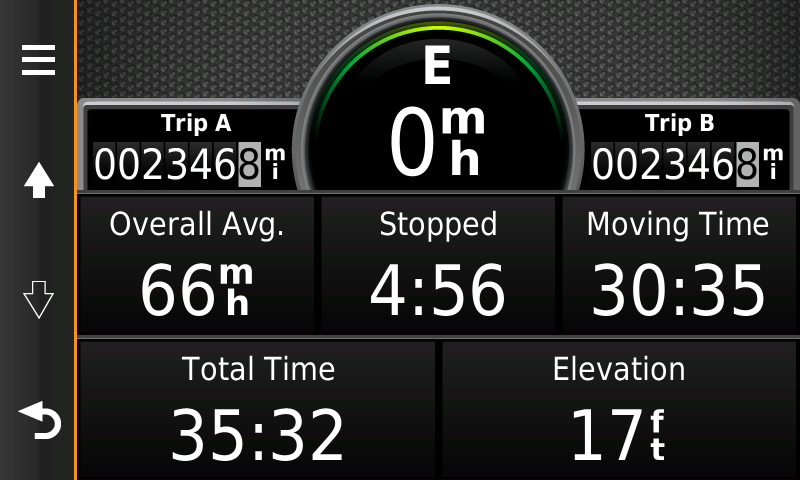 This is also from Garmin Smartphone Link app. 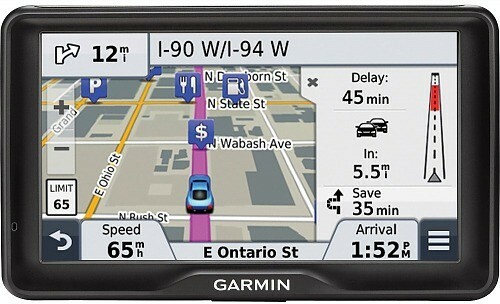 This is the current traffic screen you see from Garmin Smartphone Link app. 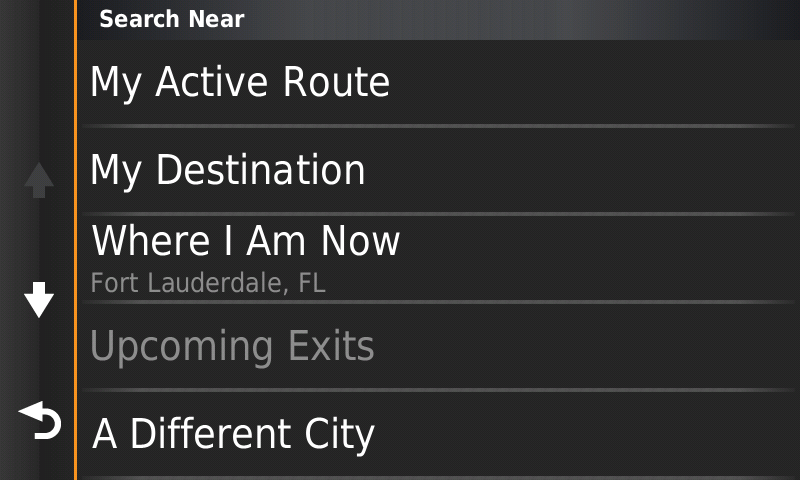 One of the route guidance screen you see while you have a route active. Route data on the right. You can pick what data is shown in the panel on the right. Up Ahead panel on the right. 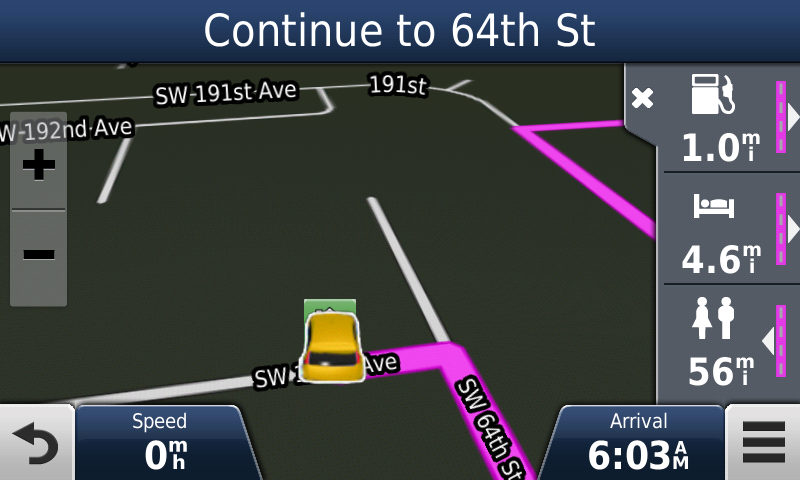 This is configurable and shows you what is up ahead and the white arrow points to what side of the street it is on. This is what you see when you touch the Up Ahead gas station icon. It will show you the gas station. Up Ahead search on an interstate highway, notice the exit information. When you do a search you have many options on how to search. 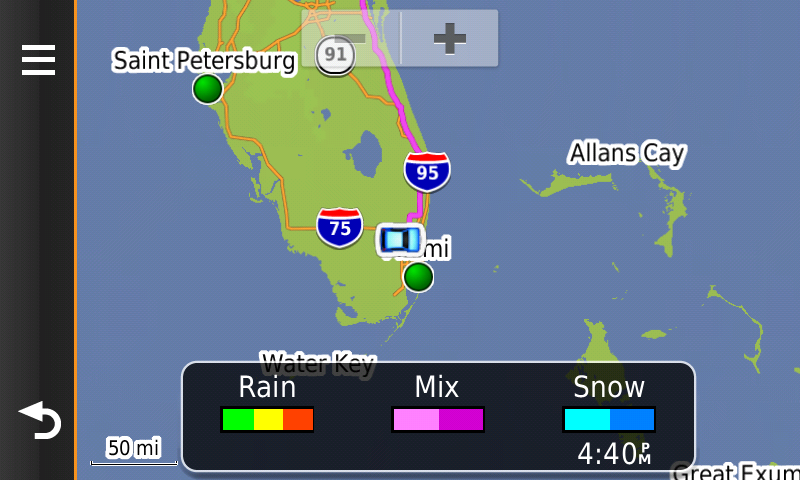 Weather displayed on the map screen so you can still see your active route guidance.